I am delighted to have spotted this plant at the corner of the workshop at the end of my road. Flowering away, minding its own business, is the plant that has been described as the ‘aspirin of the medieval world’. 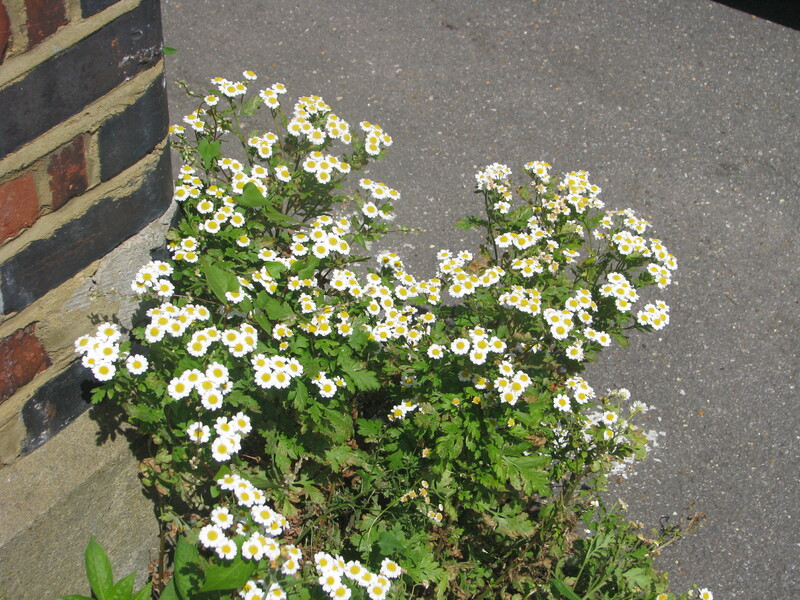 Feverfew, as its name suggests, was used for all kinds of colds, coughs and infections, and for general aches and pains. Even more excitingly, it has been proved to be extremely efficacious in the treatment of migraine, In a study of 270 migraine-sufferers, over seventy percent reported that their symptoms were significantly decreased after nibbling only one leaf a day for three months, whilst a third seemed to have eradicated their attacks altogether. If only I had known about this when I was growing up – my mother suffered from terrible, debilitating migraines, and it would have been interesting to see if this common, overlooked little plant would have helped her. 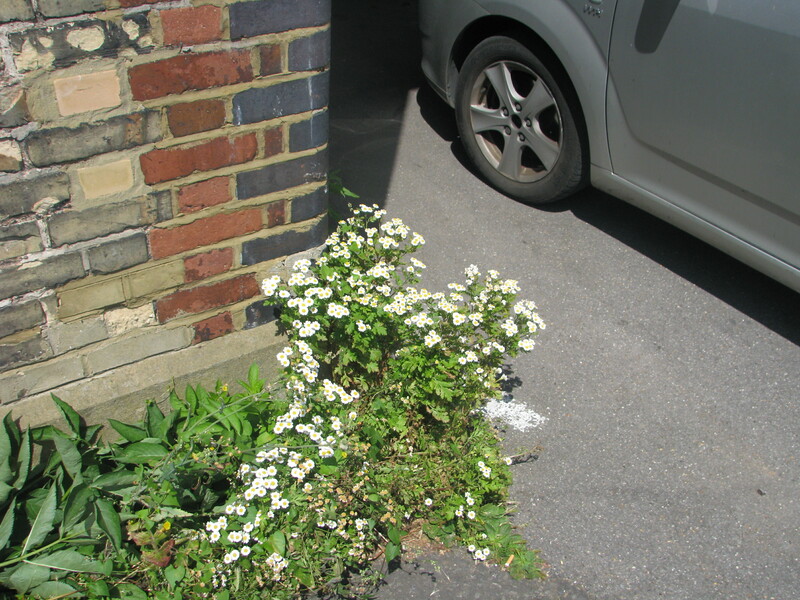 Even if it wasn’t so medicinally useful, this would be a welcome plant – it has a sunny, cheerful aspect, and certainly brightens up the rather prosaic corner of this small industrial site. As I stood on the pavement in my fluffy slippers, taking some photos, I was a source of some amazement to the workmen coming and going. One of them stopped, looked at me, looked at the plant and ruminated on what would be an appropriate comment. Eventually, it came. ‘It took us ages to grow that, you know’, he said, with the jolly sarcasm of the North London Geezer. I patted him on the arm. ‘You did a lovely job’, I said. This entry was posted in London Plants on July 9, 2014 by Bug Woman.